Ministry of Propaganda - 29/Jan/2006: "Sunday Walk"
While other expat bloggers spent their weekend at the Chinese New Year in London and at Stonehenge and Wardour Castle I decided to make the best use of the fantastic weather and went for a nice walk. 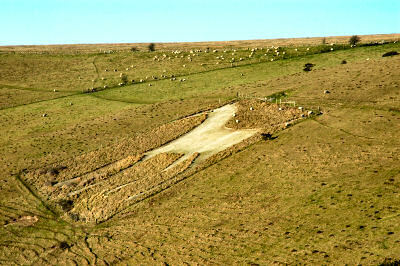 The description of the walk was from Country Walking magazine, "Alton Barnes - Roaming with the ancients". After parking my car at the Coronation Hall car park in Alton Barnes I headed for the chalk uplands of the North Wessex Downs. First stop was Adam's Grave Long Barrow, there wasn't much to see of the barrow but the view from it over the downs and Pewsey Vale was impressive. As was the fierce biting cold wind, which made me move on fairly quickly. From Walkers Hill I had an excellent view over the Alton Barnes White Horse before continueing to Milk Hill. Here I had my lunch and unsuccessfully tried to launch the cheap (£1) kite I had bought on Friday. Either the wind was too strong and gusty, or the kite is crap, or I was just incompetent in launching it. I hope it was the first. 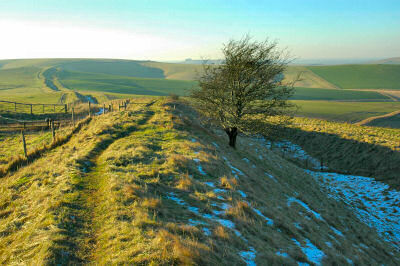 Next stop was at the Wansdyke, a Saxon earth wall sometimes called southern Britain's version of Hadrian's Wall. The section I saw was still in a good condition considering its age and impressive to see how it stretched into the distance. 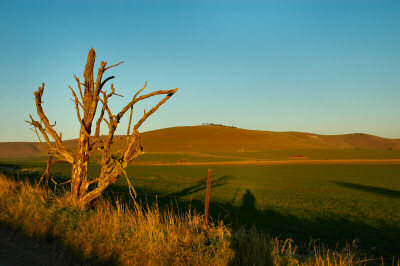 With the sun starting to set I left the upland and walked down towards Stanton St Bernard, the views back at the North Wessex Downs in the late afternoon light were very nice. In Stanton St Bernard I joined the towpath of the Kennet and Avon Canal to walk back to Alton Barnes. On the way I passed the Barge Inn at Honeystreet, a pub I plan to return to in the summer. It was too late today, but looks like a great place for a pint during the summer.